The Greeks love to eat. (Who doesn't?) 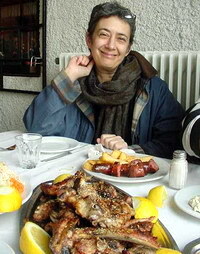 Many Americans have a fear of coming to Greece because they are afraid of the food. There's nothing to be afraid of. It's not like Mexican. Nothing is so spicy you can't eat it and the seasonings they use are the very same ones you have on the spice shelf in your Kitchen. And unlike the crappy oil that terrorizes the hearts of many Americans, Olive oil is good for you and will keep you alive long after many of your friends have taken the next step in their spiritual evolution. What usually happens when you walkinto a estiatorio type restaurant is after finding a table (almost always outdoors between the months of May and October), you will be permitted or encouraged to go to the kitchen to see what they have to offer. There will be a large steam table full of pots with different dishes in them. Pick out what looks good and don't be afraid to ask your cook, waiter or host " Tea ee neh aff-toe ?". You have just asked "What is this?" Try to remember what it's called until you get back to the table or else you can tell the guy right there "Theh-low aff-toe ." It will magically appear on your table. In Tavernas and psistarias (grill houses) there is usually not a steam table with food on display though you may be able to look at their meats which are on dislay behind a glass counter. 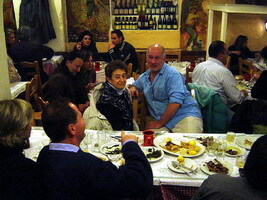 In a psaro-taverna (fish taverna) you can ask to see the fish too and make sure it is fresh. In fact it is sort of expected of you. If you don't know what a fresh fish looks like, first of all if you act like you know what you are doing they won't even show you the fish if it is not fresh. Usually the eyes are kind of clear but if you are not sure, nod your head and ask apo see-mera (from today) and the guy will probably tell you yes. If you are worried just go one morning to the fish market in Athens on Athinas street and look at all the fish until you are satisfied that you know what a fresh one looks like. You also want to know if it is sold by the merida (order) or by the kilo. Same with some of the meats too like paidakia (lamb-chops) and lamb roasted on the spit either of which come by weight or portion. Usually they come with fried potatoes but you can ask for rice or even macaronia in most places. Some of the fish may have been frozen and the squid generally comes from the Atlantic or Monterey California in the summer months. 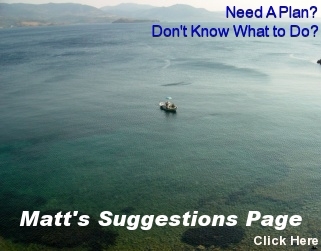 On the menus if a fish is frozen there will be the abbreviation 'kat.' after it meaning katepsigmenos (frozen). Fresh is freska. 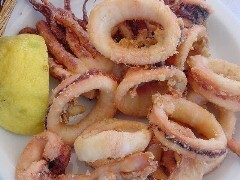 If you see fried squid on a tray don't order it. You don't want anything fried unless it is cooked to order which is generally the case. If I am beginning to intimidate you remember that 90% of the people in restaurants speak English. Bread comes automatically to the table and is included in the cover charge whether you eat it or not. Don't avoid eating it and then get into an argument about it and don't say you don't want it so you can save a couple euros. You have to play by the rules. You get bread and it is on the bill. Period. You also get a carafe of water which is normally tap water which is fine, especially in Athens. But some restaurants may try to pull a fast one and bring you bottled spring water which you have to pay for. You can return it and ask for a nero ap ti vrissi , literaly 'water from the spring', though you are asking for water from the sink. You can buy some really nice Greek wines by the bottle. Not just retsina and domestica but Merlot's and Cabernets etc by big companies like Hatzimichalis and smaller lesser known wineries. A bottle of wine will cost you about 10 euros and up. 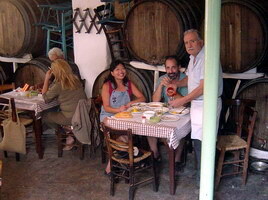 But you can buy dopio or hima which is local wine by the liter or karafaki (carafe). This does not mean the owner of the restaurant or anyone he knows made this wine in his village for his family and a few thousand tourists. It may even come in a box with a spicket. But it can be just as good as the stuff in the bottle and will be a lot cheaper. You may also find that the wine is made by the owner of the restaurant (especially tavernas) and sold only there and it may be the best thing you ever tasted. If you want to know if it is from a barrel you can ask eine ap to bareli? and if the answer is nai (yes) or ah-meh (a more emphatic yes when it comes to wine) then you are drinking someone's home-made wine. But even if it comes from a box, chances are that once, maybe a long time ago, this too was someone's home-made wine. If the restaurant is full of wine barrels chances are good that it is home-made. Usually the first guy who comes to your table will bring the silverware, bread and water and he may take your order for drinks. The waiter comes next and you should not be shy about taking him by the hand and showing him what it is you wanted if you can't find anything that sounds like it on the menu. Some people have an ouzo and an appetiser before beginning and you are under no obligation to order your main course right away. 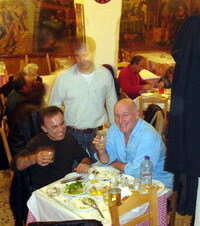 In fact if you like you can sit there all night ordering ouzo and appetisers in most restaurants. When we go to eat I always look at the menu but most people just ask the waiter whats good. In fish restaurants they will tell you the barbounia because they are always good and always expensive, unlike the lobster which are sometimes good and always expensive. But in most restaurants they will push the most popular dishes. Many restaurants are known for something they do particularly well. 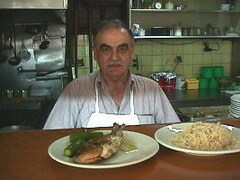 For example Rolando's in Kea is known for his technique of frying fish. 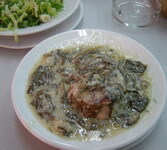 Saita in the Plaka is known for his wine and his bacalliaro (fried cod). Taverna Psiri is known for their paidakia (grilled lamb-chops). Other restaurants are known for just having decent food, nothing special but everything pretty good for example Plaka, Byzantino, and To Hani in the Plaka. In Greece you can keep ordering. Its not like you have to sit down and order your appetisers, your main course and that's it. If you liked something order another one. Try and get the waiter's name so you can hail him as he passes your table (psssst Yanni, ena beefteki acoma parakalo - pssst John, another beefteki please). If you are drinking wine and just show them the empty carafe they will be right back with more. 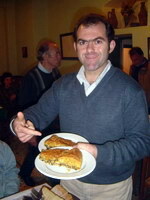 Greek waiters are very informal. They may even sit down at your table or squeeze your little girl's cheeks (Greeks love children). They don't care if you spend hours at your table. Unlike in the USA where they love turnover, in Greece you are expected to eat slowly and eat a long time and linger after a meal, eating fruit, smoking cigarettes and drinking more wine or a coffee. Never feel like you are under pressure to give up the table to someone else. At the end of the meal you will get a bill which is supposed to be a printout from a cash register though if you are in a far off village where the tax people rarely come it may just be a scrawled piece of paper. By law there has to be a receipt for everything on the table and so it should not surprise you if at the end of the night you have a handful of these little receipts. It won't take much work to find the updated one. The reason this is done is not so they can keep track of what you are eating. They know. It is so the government can keep track of what the restaurant is selling. If a tax person comes into a restaurant and the tables don't have receipts they can be charged thousands of euros for each infraction. Some restaurants will offer you complimentary fruits or a desert after a meal. If you come back to the same place over and over again you may hear the magic words "Ti na sas keraso?" which means what can I treat you to? 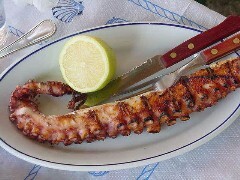 The correct answer is a beer or a karafaki of wine or a coffee, not a lobster or a kilo of barbounia. You will notice that the menu says a 15% gratuity is included. That may be but it does not mean it will go to the waiter. Generally the procedure is to take them at their word that the waiter's tip is indeed part of the bill and then leave a few small coins for the boy who cleans up the table. But having known enough waiters who have told me that they never see that 15%, I leave something close to that at a restaurant, maybe between 10 and 15% because you don't know which restaurants they get it and which they don't. Anyway if a waiter deserves 15% you will know it and if they deserve less you will know it too. There is a silver lining to all this. If you go to a restaurant and get it sto packeto (in the package) which means to go and take it to your room and eat it. Your price will be minus the 15%, which is why on many menus you will see two prices. 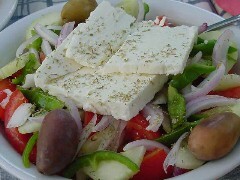 Of course anyone who orders Greek food and then sits in their hotel room eating it is either missing the fun or taking care of someone who is too ill to leave the room. But if you are on a budget or just a cheapskate you can get your meals to go and sit in the park or somewhere and eat it.